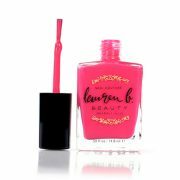 Our advanced, quick-drying nail enamels deliver a chip-resistant, long-lasting, mirror-like finish. The brush is packed with twice the standard amount of bristles, all pre-lacquered so your polish glides on smoothly and streak-free. The bottle has a special over-cap, so you can use a square or cylindrical handle for more control. Bonus: Each formula is non toxic, eco- and vegan-friendly (with no formaldehyde, formaldehyde resin, DBP, toluene or camphor), TPHP free, and proudly made in the USA. I love the vibrant color! I love the hand polish would love to try their nail polish and that is a pretty color. Went on smoothly. Stayed on my nails forever.